Be Money Wi$e: Financial Empowerment Panel Discussion - Event Recap — D.R.E.A.M. 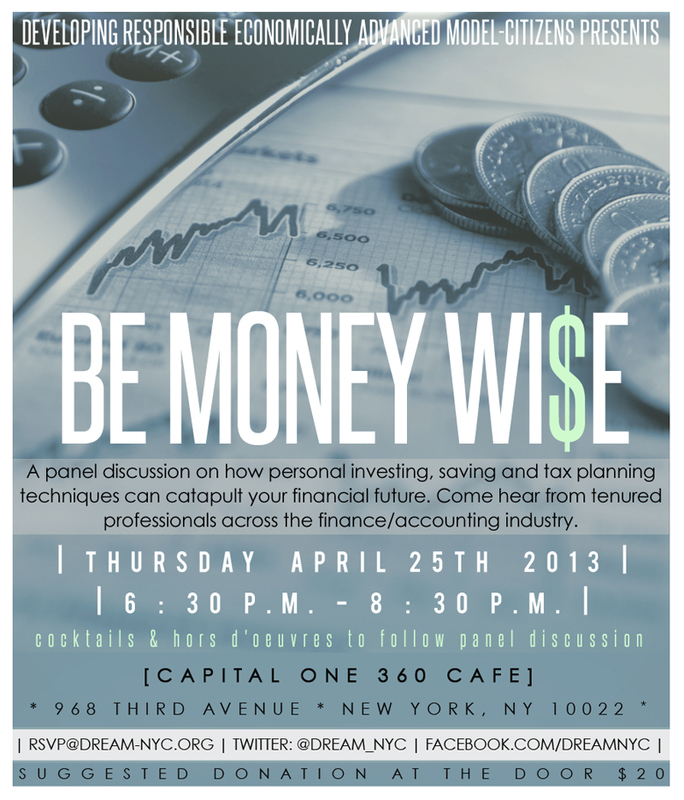 On April 25th, 2013 we hosted Be Money Wi$e: Financial Empowerment Panel & Discussion at the brand new Capital One 360 Café in New York City. The event was held in recognition of National Financial Literacy Month. The evening provided a great opportunity for professionals across various industries and backgrounds to mix, mingle, and share financial tips. Michael Prout is the Managing Partner of Proutax Accounting Services—an accounting and tax consulting firm. He also serves as a financial literacy educator at the University Academy Charter HS in Jersey City, NJ. Mr. Prout is a Military Police and Food service specialist for the U.S. Army Reserves. Michael has over 20 years of tax experience and has been running his boutique tax advisory firm for over 14 years. His area of expertise is in small businesses, specializing in real estate and medical professionals. Jhoselin Fernandez is currently the District Manager for the Capital One branches located between 45th and 69th Street in Midtown Manhattan. She is responsible for strengthening Capital One's performance and community presence in this market, as well as leading Capital One sales efforts for retail and commercial banking across 13 branch locations. Ralph Ervin is a Financial Advisor with Northwestern Mutual. Mr. Ervin works with affluent professionals and their families, including many from the largest Investment Banks, Hedge Funds and Private Equity Firms to develop financial strategies which are in alignment with their most important objectives. Ralph Ervin also helps clients preserve their estates, ensuring that the resources they’ve worked hard for go to the people and causes they value most. Ralph has 12 years of industry experience; 9 years with Northwestern Mutual. We would like to thank everyone who made the night a success. Firstly, words cannot express the gratitude we extend to Kevin Corrigan and the entire Capital One 360 Café staff for hosting the event. Kevin Corrigan and Capital One 360 have been tireless supporters of our mission and we are extremely thankful for their unwavering support. Secondly, we would like to extend our appreciation to our great panelists. We are thankful that they willingly donated their time to provide valuable financial tips to the D.R.E.A.M. family. We would like them to know that their invitation to our events is open and endless. Thirdly, we would like to thank all of our loyal supporters that attended the event. Your consistent support makes all of our events special. We would also like to thank to all of our new and first time guests. We hope you learned a little bit more about what we do, found the panel insightful, and left with a renewed sense of energy to master or continue mastering your finances. And lastly, we would like to extend a big thank you to the person that inspired and coordinated the planning of this extraordinary event, Ms. Stacey Pettice! We are thankful for your commitment and service. We hope you enjoyed National Financial Literacy Month 2013. Our goal for this month was to provide you with relevant information to help you master your personal finances and to begin (or continue) making sound financial decisions. Just because NFLM is over doesn't mean the fun and learning stops now! Please continue reading our blog for insightful information on how to better manage your personal finances in addition to updates about our upcoming events! To view the complete photo album from the event, please visit our Facebook page. And don't forget to "Like" our page if you have not done so already!